PIERRE, S.D. 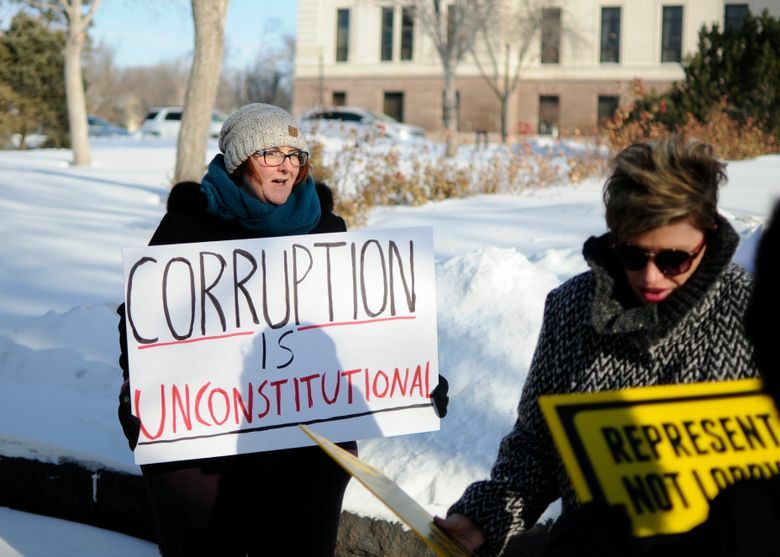 (AP) — South Dakota legislators are set to dismantle new ethics regulations that voters imposed on them less than three months ago, a brazen test of whether elected officials or their constituents should have the final say. The ethics crackdown is one of several November ballot measures that are now facing scrutiny in statehouses across the nation. But the South Dakota law appears to be under the most imminent danger of repeal and directly affects the very lawmakers who are weighing its fate. Under the new South Dakota law, called Initiated Measure 22, voters could tap a state fund to give two credits worth $50 each to participating political candidates. It limits lobbyist gifts to lawmakers to $100 annually, a major change given there were previously no caps. It also calls for an independent commission to ensure state ethics laws aren’t violated and administer the public campaign finance program. Top Republican lawmakers contend those provisions are unconstitutional. They challenged the overhaul in state court, which put the initiative on hold while the case moves forward. Elsewhere, Maine Gov. Paul LePage has said he wants to mitigate the “severe” damage done by citizen initiatives, including a minimum wage hike, while Massachusetts and North Dakota have delayed marijuana initiatives to give officials more time. But the South Dakota push appears to be the most concrete effort so far to overturn a 2016 ballot measure, said Josh Altic, ballot measures project director at Ballotpedia, an encyclopedia of American politics. At least 10 states, albeit not South Dakota, have provisions to protect citizens’ initiatives from state lawmakers, according to the National Conference of State Legislatures. For example, Alaska and Wyoming lawmakers can’t repeal an initiative within two years. It takes a two-thirds majority in Arkansas and Nebraska to amend or repeal, while the California Legislature can’t repeal or amend an initiated statute unless the measure specifically allows it. After the South Dakota measure barreled through the state House, the Senate was to vote on the repeal bill, but Republicans used a procedural move to postpone further debate into this week. GOP Gov. Dennis Daugaard has said he plans to sign the bill if it reaches his desk. It would take effect immediately and couldn’t be referred back it to the ballot. GOP Rep. Larry Rhoden, the repeal bill’s main sponsor, said the ethics initiative is an “absolute train wreck.” Republicans have criticized advertisements during the campaign depicting lobbyists handing officials cash, calling them deceptive. Ben Bycel, a former chief ethics officer for the city of Los Angeles and the state of Connecticut, said he’s heard similar criticisms throughout his career as arguments to kill ethics reforms. Speaking before a Senate committee, Roxanne Weber, 48, of Pierre, acknowledged that lawmakers found the ads offensive. “What I find offensive is to have to sit here and beg for my right as a citizen to have a say in what happens to be a bill that I voted for,” she said. Lawmakers have filed several proposals that would replace provisions of the initiative, including similar restrictions on lobbyist gifts and more limited watchdog commissions. Senate Majority Leader Blake Curd said the Legislature is trying to “incorporate the will of the people in a constitutionally valid fashion,” not reject it. Doug Kronaizl, a spokesman for pro-initiative group Represent South Dakota, said in a statement that the replacement bills the Legislature is considering are merely “deceitful window dressing that would protect the corrupt status quo” in the state Capitol.